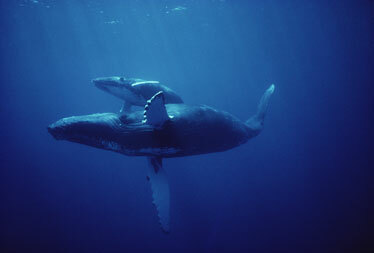 A humpback whale mother and calf in Hawaii waters. Anyone with Internet access can listen to whales and see what the deep ocean is like in real time, thanks to an observatory that was recently lowered 16,500 feet to the sea floor about 60 miles off Oahu. To listen to whales in real time on the Station Aloha hydrophone, go to the Aloha Cabled Observatory Web site, www.soest.hawaii.edu/GG/DeepoceanOBS. "We're pushing the Internet, not only offshore into the ocean, but down into the deep ocean," said University of Hawaii oceanographer Roger Lukas. Ocean temperature, currents and other information from instruments attached to the observatory will be accessible worldwide over the Internet in real time, he said. Humpback whale songs were the first sounds heard in February when UH scientists placed what they call a "Proof Module" of an Aloha Cabled Observatory at Station Aloha, an oceanographic research site. "The observatory has been much fun so far," said Fred Duennebier, UH geology and geophysics professor and principal investigator of the project in the School of Ocean, Earth Science and Technology. Duennebier, who developed the observatory, said it is similar to others he has designed for ocean research, but "the cable is far more powerful, with much higher data rates and more electrical power." "A package containing a hydrophone (underwater microphone) and a pressure sensor for recording tsunami and tides went down with it, just so we could get some data before November," Duennebier said. He said he is building the full observatory, which will have eight ports where users can plug in experiments on the ocean floor, to be deployed in November with the remotely operated vehicle Jason II on the UH research vessel Kilo Moana. At higher frequencies, Duennebier said, the observatory should be able to detect earthquake waves and possibly signals from distant shallow submarine volcanic eruptions. With the pressure sensor, it can detect sea level changes of a few millimeters, he said. "We should be able to detect even a very small tsunami, and we'll also see the passage of ocean waves from distant and local storms." Lukas said the project "continues a trend of moving toward what we call real-time oceanography, where we're actually able to see what is being measured as it's being measured." The scientists expect Aloha Observatory to provide power and communications necessary for real-time continuous monitoring of the ocean for at least a decade. They plan to re-engineer their Web sites for the data as soon as they have time, so "it's a nice site not just for scientists, but for the public and schools to access," Lukas said. Lukas has been a key researcher at Station Aloha since UH scientists began making monthly shipboard observations of the water in 1988 in the Hawaii Ocean Time-series program. Two surface moorings with instruments in a few hundred feet of water, as well as on a surface buoy, transmit a limited amount of data by satellite, Lukas said. But they have to supply their own power, he added. In the future, he said, the moorings could obtain their power from the cable and transmit data back to shore in real time. "We also now have the capability of reconfiguring our instruments from shore -- not just seeing what they recorded, but telling them to sample differently," he added. The National Science Foundation has funded the project with about $2 million spent so far and another $500,000 allocated, Duennebier said. The scientists will write a proposal this summer for funding to build more experiments and manage the observatory and data flow, he said. An Aloha Cabled Observatory placed at an ocean research site off Oahu by University of Hawaii scientists will be tied in to a $313 million, six-year national program called ORION. The National Science Foundation's Ocean Research Interactive Observatory Networks project is an attempt to solve problems scientists have had in observing the ocean, said UH oceanographer Doug Luther, chairman of ORION's Science and Technical Advisory Committee. "The main problem we've had is we can't be in the ocean for long periods of time." ORION will place instruments in the deep ocean that can communicate with scientists for long periods of time, Luther said. "The most exciting way is through these cabled observatories, and the Aloha project is one of them," he said, adding that it is the first in such deep waters. Observations by ship can be done only for a few weeks, and the data has a lot of variability, Luther said. "Is this normal for that location? Is it representative of the rest of the ocean? You don't know." And it is difficult to repeat the cruise because of a lack of ship resources, he said. Luther, who studies ocean turbulence, said moorings were recently deployed at various locations to look at turbulence over a long period of time. "There is a phenomenal lack of knowledge of physical and biological phenomena (in the ocean) and how they change in time," he said. "The observatories will help change that lack of knowledge." The ORION program is expected to start in fiscal 2008, and Station Aloha north of Oahu is one of the sites slated for additional instrumentation as well as operational and maintenance funds, Luther said. A larger cabled ocean observatory is planned through ORION at Juan de Fuca Plate, coming out of a location in Oregon and making a big loop, he said. The Canadians also will start building a cabled observatory late this year that will come off Vancouver Island and loop around Endeavor Seamount, he said. Between the two of them, Luther said, a large area of sea floor will be covered with a fiber-optic cable network that scientists can put instruments on to study water column biology, chemistry, geophysics and other things. "They'll be able to put robots on the sea floor in little garages, and if there is an earthquake, they'll be able to run out to the earthquake site to make observations, measure the heat flow from the sea floor and the chemical quantities and characteristics. The hydrogeology of the sea floor is a very interesting focus at Juan de Fuca." A group is going to put out microphones to listen to animal communications and track whales and dolphins to learn migratory patterns, he said.